Boron is a metalloid with uses in the nuclear power industry. It is also used in agriculture, cleaning products, glassmaking, flame retardants, and other industries. Elemental boron is a metalloid which has limited commercial applications. Boron compounds, chiefl y borates, are commercially important; therefore, boron products are priced and sold based on boric oxide content (B2O3), which varies by ore and compound, and on the absence or presence of sodium and calcium. Borax, one of the most important boron minerals for industrial use, is a white crystalline substance chemically known as sodium tetraborate decahydrate and found in nature as the mineral tincal. Boric acid, also known as orthoboric acid or boracic acid, is a white, colorless crystalline solid sold in technical, national formulary, and special quality grades as granules or powder. Colemanite (hydrated calcium borate), kernite (hydrated sodium borate), tincal, and ulexite (hydrated sodium calcium borate) were the minerals of most commercial importance in the United States. The majority of world boron supplies are found in Turkey. World production of boron minerals in 2009 was an estimated 3.51 million metric tons. Domestic Production and Use: Two companies in southern California produced boron minerals, mostly sodium borates. Most of the boron products consumed in the United States are manufactured domestically. To avoid disclosing company proprietary data, U.S. boron production and consumption in 2010 were withheld. The leading boron producer mined borate ores containing kernite and tincal by open pit methods and operated associated compound plants. 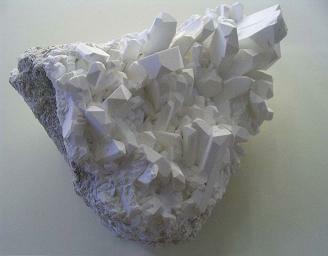 The kernite was used for boric acid production and the tincal was used as a feedstock for sodium borate production. A second company produced borates from brines extracted through solution mining techniques. Boron minerals and chemicals were principally consumed in the North Central and the Eastern United States. The estimated distribution pattern for boron compounds consumed in the United States in 2010 was glass and ceramics, 78%; soaps, detergents, and bleaches, 4%; agriculture, 4%; enamels and glazes, 3%; and other, 11%. Import Sources (2006–09): Boric acid: Turkey, 59%; Chile, 22%; Bolivia, 8%; Peru, 5%; and other, 6%. Events, Trends, and Issues: The global economic downturn in the last quarter of 2008 and through most of 2009 negatively affected sectors vital for boron consumption, such as the construction and automotive industries. The moderate economic recovery in 2010 created steady growth in boron production and consumption. Demand for fiberglass, the principle use of boron, was expected to increase 2.3% annually through 2012. Consumption of boron used in high-technical fiberglass sectors, such as in electronic products and wind turbines, was expected to increase by 10% in North America and by 13% in Europe by 2012. Demand for borates was expected to shift slightly away from detergents and soaps towards glass and ceramics. Although borate consumption in China decreased in 2009 owing to the economic downturn, consumption was projected to increase driven by demand from its domestic ceramic and glass industries. With low-grade domestic boron reserves and the anticipated rise in demand, Chinese imports from Chile, Russia, Turkey, and the United States were expected to increase over the next several years. Europe and emerging markets were requiring more stringent building standards with respect to heat conservation, which directly correlates to higher consumption of borates for insulation fiberglass. Continued investment in new refineries and technologies and the continued rise in demand were expected to fuel growth in world production over the next several years. World Resources: Large deposits of boron resources containing high B2O3 content occur in southern California and in Turkey. U.S. deposits consist primarily of tincal, kernite, and borates contained in brines, and to a lesser extent ulexite and colemanite. About 70% of all Turkish deposits are colemanite. Small deposits are being mined in South America. At current levels of consumption, world resources are adequate for the foreseeable future. Etimine - http://www.etimine.com/ - Turkish producer of anhydrous borax, borax pentahydrate, borax decahydrate, boric acid, and boron oxide. AXT, Inc - manufactures and sells raw materials to the semiconductor substrate industry through joint ventures in China. These materials include boron, arsenic, gallium, and germanium. American Elements - http://www.americanelements.com/bb.html - Ferroboron, boron carbide, boron nitride, boric acid, boron phosphate, and potassium tetrafluoroborate. 2011-05-27 - (mw) - South Korea to help Japan restore boron stock according to Merchant Research & Consulting, Ltd.